One hundred and fifty students from the summer intensive subject Astronomy in World History had the opportunity to see up close objects from the exhibition Plotting the island: dreams, discovery and disaster before it opened to the public on 23 February. 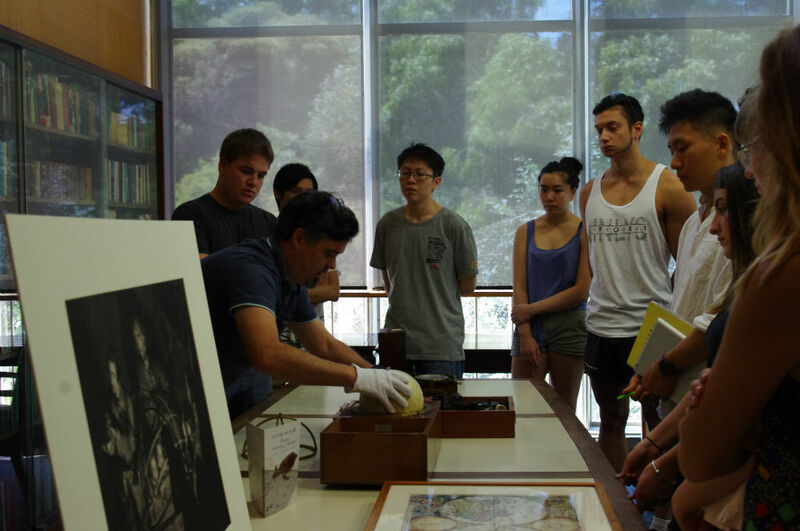 Of particular interest were the historical instruments, including the star globe, an instrument which allows the observer to determine the altitude of any fixed star, from The University of Melbourne's Surveying and Geomatic Engineering Collection. Students also saw world maps featuring planetary systems which provided insight into how astronomical knowledge has developed throughout the world. Plotting the island: dreams, discovery and disaster is on display in the Noel Shaw Gallery, Baillieu Library until 16 July 2017.